Users of this product require a basic level of skill and ability. Do NOT buy the product if you are unable to do a basic manicure using standard nail polish or if you do not have steady hand control and good eyesight. Angelic Nails gel products are cured by exposure to UV light. Do not expose product to Direct Sunlight or light from a Halogen source while using the product. Store Angelic Nails products in a dark, dry environment. You will receive an account designation upon completing the registration process.You will also have chosen your own password. You are responsible for maintaining the confidentiality of the password and account and are fully responsible for all activities that occur under your password and or account. You agree to (a) immediately notify Angelic Nails (Pty) Ltd of any unauthorized use of your password or account or any other breach of security, and (b) ensure that you exit from your account at the end of each session. Angelic Nails (Pty) Ltd cannot and will not be liable for any loss or damage arising from your failure to comply with this section. This site is owned and operated by Angelic Nails (Pty) Ltd (referred to herein individually or collectively as, "we," "us," or "our"). No material from angelicnails.co.za or any website owned, operated, licensed, or controlled by Angelic Nails (Pty) Ltd may be copied, reproduced, republished, uploaded, posted, transmitted, or distributed in any way. Modification of the materials or use of the materials for any other purpose is a violation of our copyright and other proprietary rights. For purposes of these terms, the use of any such material on any other website or networked computer environment is prohibited. All trademarks, service marks, and trade names are proprietary to their owners. Angelic Nails (Pty) Ltd may provide, or third parties may provide, links to other World Wide Web sites or resources. Because Angelic Nails (Pty) Ltd has no control over such sites and resources, you acknowledge and agree that Angelic Nails (Pty) Ltd is not responsible for the availability of such external sites or resources, and does not endorse and is not responsible or liable for any content, advertising, products, or other materials on or available from such sites or resources. 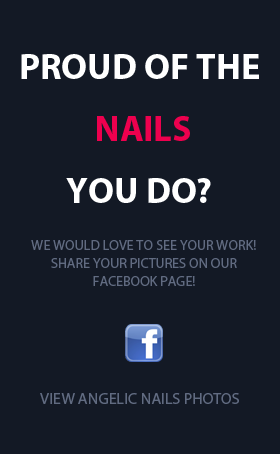 You further acknowledge and agree that Angelic Nails (Pty) Ltd shall not be responsible or liable, directly or indirectly, for any damage or loss caused or alleged to be caused by or in connection with use of or reliance on any such content, goods or services available on or through any such site or resource. All descriptions are accurate to the best of our ability but omissions can occur with either images, specifications or other text relating to the product. If we find that the error has been fundamental in its misinformation we will gladly refund the purchase in full as long as you notify us within 48 hours of receipt of the shipment. As we are bound to exchange rate changes and how the distributors pass these on, there may be rare unfortunate instances where we will have to contact you with a price adjustment after you have placed you order. You will be given the opportunity to cancel you order for the affected item. If we have tried to make contact with you via your supplied details on both phone and email, we will reserve the right to make a binding decision if you have not responded with 7 working days to the first request e-mail we sent to you. South African issued MasterCard & Visa credit card transactions and EFT/bank transfers are acceptable. All goods will only enter the shipping process when the payment has been cleared in our account. Credit Card payments are made through our third party payment gateway. Transactions are acquired by PayFast, using uses the strictest form of encryption. Visit www.payfast.co.za We do not store any payment Card or Account details on our servers. All other personal information that you provide is stored in an encrypted format on our servers. the user acknowledges and confirms Angelic Nails (Pty) Ltd indemnity to, including but not limited to, indirect, direct, incidental, special, consequential or punitive damages arising from the use of or inability to use Angelic Nails (Pty) Ltd sites. The user acknowledges that the provisions of this paragraph shall apply to all the contents of the Angelc Nails (Pty) Ltd sites. the disclaimer of liability applies to damages or injury, including but not limited to, indirect, direct, incidental, special, consequential or punitive damages or any damages whatsoever arising from use or loss of use of data, whether in breach of contract, tortious action, negligence, or under any other cause of action. If any of the terms and conditions of this agreement should be deemed to be unlawful, invalid or otherwise unenforceable by reason of the laws of the South Africa in which these terms and conditions are intended to be effective then to the extent only and within the jurisdiction in which that term and condition is illegal, invalid or unenforceable, it shall be severed and deleted from this agreement and the remaining terms and conditions shall survive, remain in full force and effect and continue to be binding and enforceable.